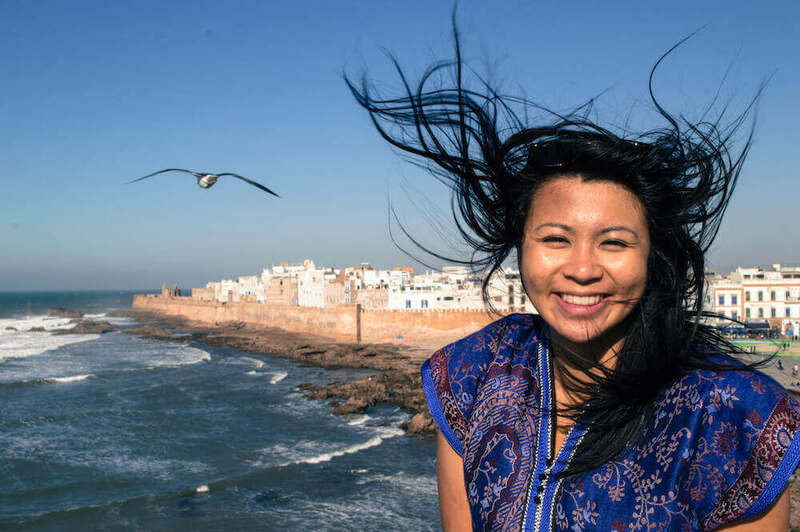 The question of what to wear in Morocco is usually one of the #1 questions and concerns first-time travelers have after they’ve booked their ticket. After all, it’s a little confusing. 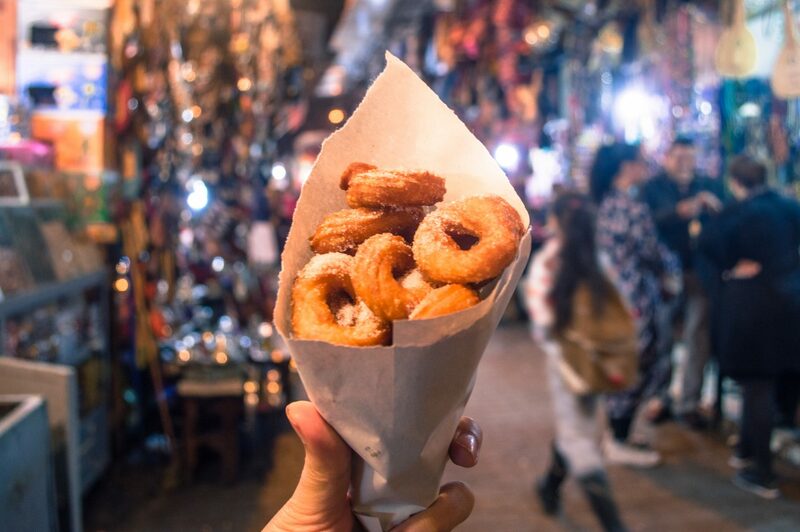 Morocco is a Muslim country, but it’s a popular one with tourists, and with constant photos on Instagram featuring gorgeous girls in flowy dresses, twirling their way around the most scenic spots in the country, you might wonder: is that like, allowed? Since I know packing for Morocco can be the biggest pain in the biggest of butts (new expression I just made up – roll with it), I’ve decided to put together this handy, comprehensive guide about what to pack for a trip to Morocco, what to wear when visiting Morocco and course a free printable packing list which you can download here. 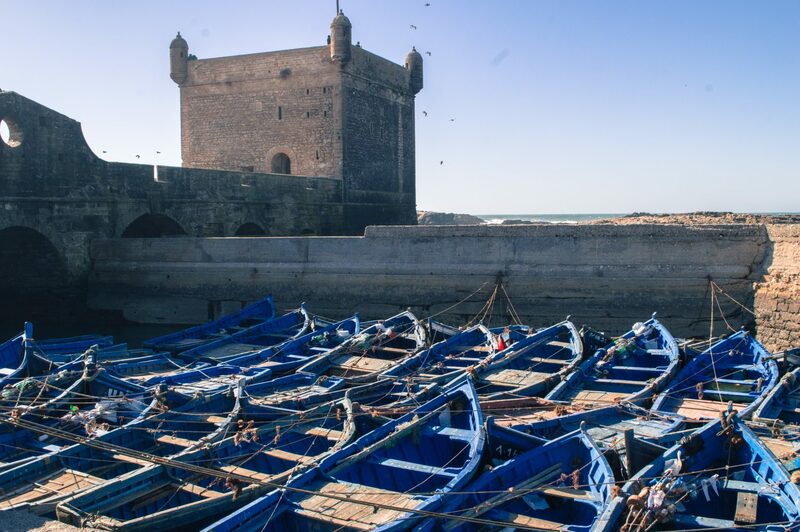 14 Crucial Morocco Safety Tips + Common Scams: Is Morocco Safe For Tourists To Visit? Where in Morocco are you going? People often forget what a diverse country Morocco is in terms of geography. Not only do you have a sprawling coastline to the west and the Sahara Desert to the east, but you also have mountain ranges, agricultural plains and metropolitan cities sprinkled in between. As such, the question of “what to wear in Morocco” is a sticky one that depends a LOT on your eventual itinerary. What you’ll pack for a city trip in Marrakech or Fes will likely look a little different than say, if you were going to hit the Sahara Desert with a squad of excited camels. Your Morocco packing list only gets more confusing if you intend to do many of these different activities through the course of one trip (which many ballers do). So, remember to keep in mind your itinerary before you start creating your packing list. 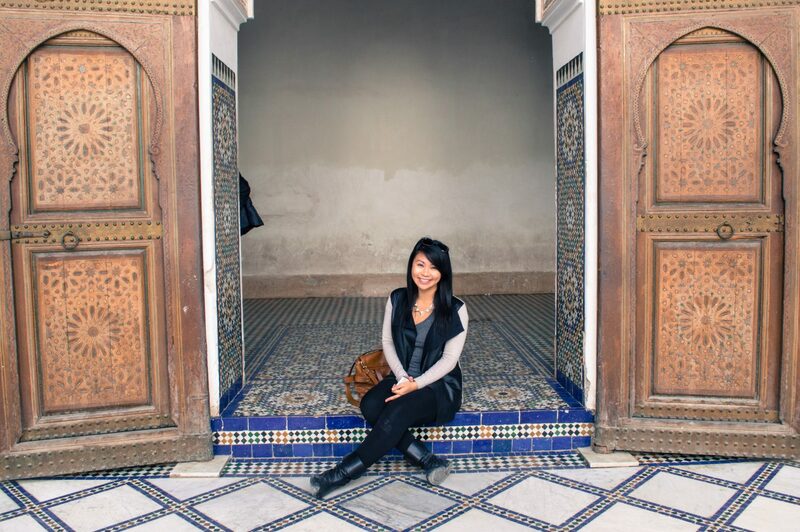 Pssst, if you’re headed to Marrakech, you can read my Marrakech-specific packing list here. What time of year are you visiting Morocco? More extreme temperatures (e.g. colder winters and hotter summers) the further you get from the ocean. Whereas coastal locations in Morocco have summer temps ranging from 18- 28°C, the interior can expect scorching temperatures up to 35°C. Along the Western coast (think around Casablanca and Essaouira) winter temperatures average 12°C while reaching 25°C and higher from June to September. Inland in Fes, temperatures are more extreme, with summer ranging from 29-35°C and at times climbing up to 38°C. Winters can be significantly chillier, with daily temperatures averaging 18°C, dipping down to 5°C – 7°C after sunset. Farther south in Marrakesh, winter temperatures average 18°C, and it’s pretty much sunny year-round, although temperatures can dip to 5°C. at night. During the summer, temperatures are around 36°C, or even 38°C when you also have the Sahara desert winds blowing. Lastly, the Atlas Mountains are usually cold throughout the year, dropping below zero in winter. The Moroccan Sahara is similarly cold at night, even near-freezing during the winter months. Factor these destinations/temperatures into your final Morocco packing list to ensure that you’re adequately prepared for the weather, and aren’t left to shame-shop in the medina because you didn’t pack properly. What activities will you be doing in Morocco? Next, you should consider the different activities that populate your itinerary. That’s because the way you pack for a surf camp in Agadir will be dramatically different from a city trip in Marrakech, or an overnight Sahara camping experience, or a hiking trip in the Atlas Mountains. … woah damn. Morocco is so cool. Anyways, before you write out your packing list for Morocco, make sure you think about the different excursions and activities that you plan to do. Can you imagine booking a camel ride after realizing your entire wardrobe is short skirts? That would most likely not end well. How should women dress in Morocco? How should men dress in Morocco? This section is a quick overview of basic ground rules and principles to stick to. You’ll be able to find more detailed tips and a full packing list below. There are no legal requirements when it comes to what tourists should wear in Morocco. Legally speaking, you’re not bound to anything, but I would say there’s still an unstated dress code for women in Morocco, and an unspoken expectation that you’ll dress relatively conservatively and not show too much skin. But that’s really not too complicated or difficult to pull off. The foundation of the Moroccan female dress code is (in my opinion) to simply dress for comfort and modesty. Namely, cover up your legs, arms and curves and you’ll be fine. While there is a huge variety in the way that women dress in Morocco depending on where you are (cities tend to be more open-minded), it’s still a good idea to dress conservatively out of respect for local customs and also to minimize attention to yourself, particularly because catcalling can be such a big problem in Morocco for female tourists. Just like for women, there is no legal dress code for men in Morocco. And I would say there’s even less of a social expectation regarding what men should wear in Morocco. You dudes are lucky – you can get away with a lot more! Most of the de facto rules around how to dress in Morocco come down to modesty and minimizing unwanted attention. Because men aren’t as frequent victims to this sort of attention as women, you have a lot more freedom to dress as you please. The main no-no I would say is sleeveless tops – you should at least aim to have your shoulders covered. Apart from that, dress for comfort. Even shorts are okay! One thing I will note though is you should avoid wearing overly flashy accessories like watches, or carrying a big-wallet visibly in your pocket, simply because this will draw attention to you as a target for theft. Besides that, go wild. So, let’s quickly break down what wouldn’t be appropriate clothing to wear in Morocco (for women, because men have far fewer restrictions and considerations). Generally speaking, things like spaghetti straps, tube tops and crop tops (anything that exposes a lot of skin) are a pretty terrible idea to wear in Morocco. The only exception is if you decide to cover up with additional cardigans, scarves, etc, but rocking any of those on their own are a sure recipe for unwanted attention. In a similar vein, I would avoid bringing any shorts, and non-maxi dresses (again, unless you intend to wear leggings below them). I know this sounds extreme, but it really does make a difference. On one of my travel days in Marrakech, I had ditched my leggings/long pants in favour of a knee-length skirt and noticed so many more creepy stares than any other day. If this sounds nightmare-ish to you, I would stick with long skirts, dresses, and pants. Unless you’re about to star in a very bougie rap music video, or I guess, have plans at some fancy restaurants while in Morocco, I do not foresee too many situations in which a pair of high heels would come in handy. This is unless you’re one of the mega-women who actually find heels really comfortable, in which case, you go sista. The key to packing the right shoes for Morocco is comfort. You’ll be doing a LOT of walking, so forget packing a lot of different shoes “just in case” and focus instead on what’s comfortable for you to walk in (and doesn’t look like an utter trainwreck with your chosen outfits). Last but not least, I’d leave your fanciest possessions at home. “But I neeeeeeed my diamond-crusted vintage timepiece! !” wail the non-peasants. Listen, the best way to avoid pickpockets is to give them no reason to pickpocket you. Wearing designer goods and fancy jewelry does nothing but make you a walking target for theft and scams. Heck, I’d probably try to rob you too. … Just kidding. I think? Probably not a great outfit for Morocco, honestly! Okay, so bearing in mind the basic rules of comfort and covering up your arms, legs and curves, here are some ideas on the items you should wear in Morocco instead. I’ve kept things vague and in categories because I realize everybody has different styles and preferences. I for instance live in dresses (even in the winter, it’s embarrassing) and so would happily pack a trunk full of flouncy maxi dresses and call it a day. Others prefer wearing pants vs. dresses, plain T-shirts vs. flowy tops, etc. So, generally speaking, here’s what you should wear in Morocco. Remember, there’s no strict dress code, it’s all just about dressing modestly and comfortably. I also have a lot of tips for making the most of packing light if you want to read that here. Whether these are long pants (AKA trousers), maxi skirts or maxi-dresses, what’s most important in terms of choosing “bottoms” for your Morocco trip is the length and the fit. Anything you pack should reveal as little leg as possible (maxi/ankle length would be ideal). Based on personal experience, even a knee-length dress left me feeling very exposed and I could see a lot of guys staring at my legs, which was obviously not a super comfortable situation, so I would advise full-length bottoms whenever possible. Another important consideration is the fit: wearing long jeans for example won’t do much in terms of thwarting attention if they hug your curves in all the right places… Leave any tight bottoms at home and opt instead for loose-fitting skirts, pants, etc. Harem pants are great for this, and my ideal Morocco packing list would consist mostly of maxi dresses, skirts and harem pants. So important!! They’re great as a layering piece if temperatures dip, but also they’re great for covering up your legs so you can rock your favourite (shorter) dress or skirt. They can also function as pyjamas if needed 😉 Leggings are a must. Again, because we’re trying to minimize attention here, I would recommend packing tops that don’t accentuate your curves too much, and at the very least cover your shoulders. This would take any tanktops or sleeveless tops out of the equation, unless you intend to pair them with a scarf or cardigan. Some good ideas for tops might be loose-fitting T-shirts, tunic-style tops, essentially anything that doesn’t hug your figure too tightly, and of course nothing overly low-cut. This includes scarves, kimonos, light cardigans, etc. The weather can vary a lot in Morocco, and even during hot months, temperatures can drop at night. Because temperatures can be so random, I advise you bring items that are easily layerable to create warmth (or modesty) as needed. If you’ve brought a short-sleeve top for instance, having a lightweight cover-up to throw over top your outfit can help switch things up for photos, and also add an additional layer of coverage. No matter how warm you think it’ll be in Morocco, you’ll at some point require a jacket – just trust me on this one… whether it’s for a night-time walk, a spontaneous overnight excursion to the dessert or to the coast, etc. As persistently angry mothers always like to say, “doooon’t forget your jacket”. Don’t worry, for things like camel rides, they bundle you up! Now that we’ve covered appropriate clothing for Morocco, let’s chat about other things that you should add to your Morocco packing list. 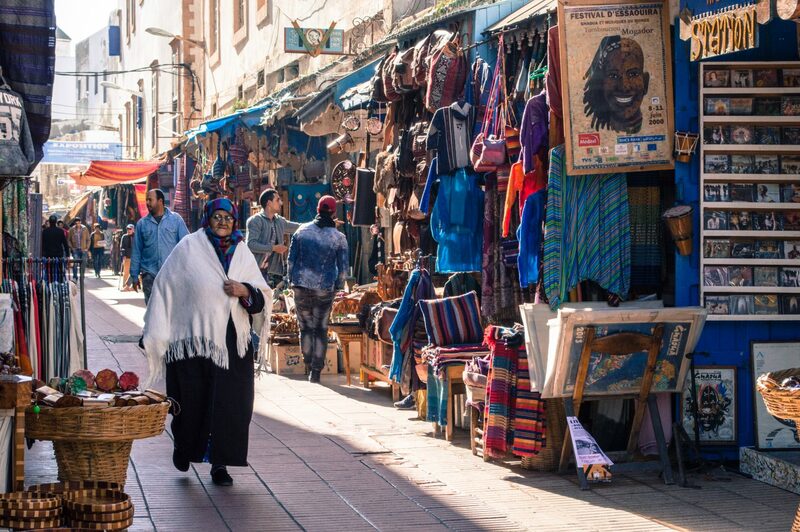 Petty, opportunistic crimes like pickpocketing and bag snatching are unfortunately one of the biggest risks to safety in Morocco. This is why I would recommend a day bag/purse that has safety in mind. All my purses usually have a secret pocket on the inside where I zip my most valuable items (that way, no pickpocket can just reach in and take my wallet). If you want to be extra safe, a slashproof, anti-theft bag might be a good travel investment. I am usually an advocate for packing light regardless, BUT especially in Morocco, I would recommend you go with a bag you can carry/wear on your bag vs. a rolling suitcase. Often walkways can be a little rough (certainly in the medinas and parts of the Old Town) and many of the riads will not have elevators and only stairs. It’s much simpler to be able to just put a bag on your bag and go. This will also make you less of an obvious target vs. someone who is rolling a loud rickety suitcase down the street. While some say that tap water in Morocco is actually okay to drink, this of course depends on where you are. While you could always buy bottles of water, getting a Lifestraw allows you to drink any water safely which is cheaper in the long run and better for the environment. You can grab one here for a relatively cheap price! I always travel with tiny luggage locks and have one in each bag just in case I ever need one. They’re really handy for thwarting pickpockets or on travel days when you want to make sure nobody can open your bag. They’re really cheap and just handy to have for any trip. If you don’t have any, you can grab a pair for really cheap here. Many of the public toilets in Morocco don’t have toilet paper, so you should definitely make sure you have some on you. You’ll also want some extra napkins/tissues just in case since you’re likely to be buying a lot of food, eating with your hands, etc. On that note, since you’ll be touching and eating all sorts of things, hand sanitizer is always a good idea. As you can see from above, there’s really no need to go out and buy specialty Morocco travel clothing or anything like that – you can easily scrounge together some Morocco-appropriate clothing from what you already have. The following is what I would bring on a week-long trip, but you can adjust it as needed. 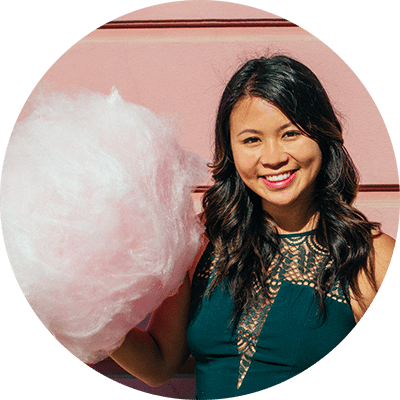 If you want to learn how to make the most of a small amount of items, I drop a lot of hot tips in this guide to packing light (without looking like a slob). 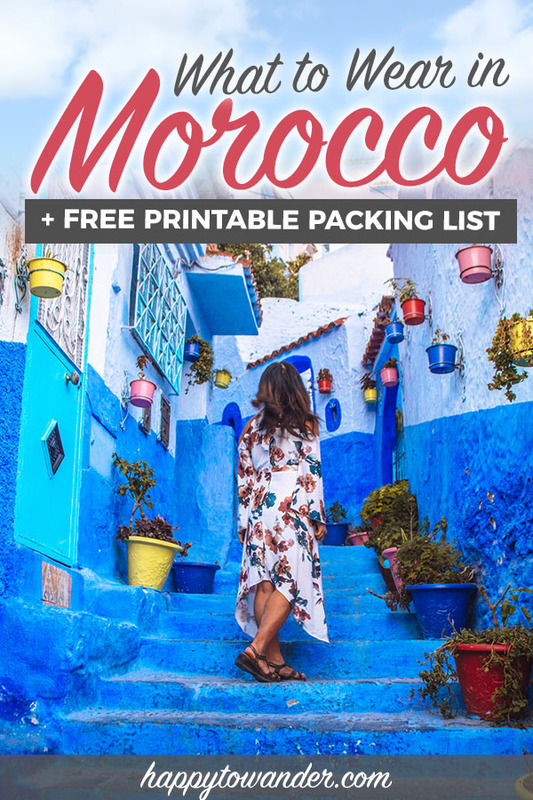 If you need a handy version of my Morocco packing list printed out, I’ve got you. Click here to download it from my Resource Library! If you’re looking for ideas on how to dress in Morocco as a female, here are some pieces I’ve pulled together that I think would be nice additions to your packing list. I’d like to think I’ve been terrifyingly thorough already, but if you still have questions about appropriate dress in Morocco, what to bring to Morocco, etc. here are some commonly asked questions that might help point you in the right direction. What do people wear in Morocco? The range of clothing that locals wear in Morocco varies a great deal depending on where you are. In bigger cities, it’s not uncommon to see a wide range of fashion choices, from traditional Djellaba robes to jeans and t-shirts like you would see in any metropolitan city. So how do people dress in Morocco? The annoying answer is it depends! That said, generally speaking, locals dress more conservatively in Morocco than in the US, Canada or Europe – you won’t commonly see a lot of skin showing for example. How do women dress in Morocco? If you’re specifically wondering “what do women wear in Morocco?”, the answer is similar… it depends! How women dress in Morocco can really vary, but generally speaking, as a Muslim country, women’s clothing leans on the conservative side. You’ll see many women wearing hijabs but not all. While you’ll spot some women wearing shorts and showing more skin in the cities (especially younger ones), it’s still advised that you dress conservatively out of both respect and to minimize attention on yourself. Is there a Morocco dress code for tourists? Legally speaking, there is no dress code that tourists are obligated to stick to. But while it’s not written in law, there are certain principles that are generally expected of tourists. Sleeveless tops are usually a no-no, and it’s more or less expected that you dress conservatively and cover up your arms, legs and curves (as I’ve said an annoying amount of times already in this article haha). Do you have to cover up in Morocco? Legally speaking, no, but for “respect’ and your own personal comfort, I would suggest covering up when you’re walking around in public in Morocco. You don’t need to wear a hijab as a female or anything, but making sure your arms, legs and curves are covered is a good idea. At your own hotel/riad of course, there is much more flexibility and you don’t need to be as careful about what you wear vs. when you’re out in public. What should female tourists wear in Morocco? There’s usually a lot of panic and confusion over what women should wear in Morocco, but it’s super simple – dress for comfort and modesty and you’ll be fine. So long as you don’t have too much skin exposed (e.g. arms, legs and curves, you’ll be okay. Still stuck? You can refer to my packing lists and outfit tips above for what to wear in Morocco as a woman. No need to buy special clothes – just cover up! What should men wear in Morocco? Luckily for guys, they get a lot more flexibility when it comes to choosing what to wear in Morocco. Dress for comfort and avoid sleeveless tops – that’s about it. What shoes should I bring to Morocco? The most important thing to consider when deciding what shoes to wear in Morocco is comfort. I love walking in comfortable sandals, but others prefer close toed shoes because the streets (especially in the Old Town) can be really dusty and so your feet get pretty gross at the end of the day. What I would avoid are impractical shoes like heels and flip flops for walking around, but otherwise, bring whatever shoes you find comfortable (and match reasonably well with the clothing you bought). Where can I get myself some Moroccan style dress? One of the best parts about visiting Morocco is the abundance of cool shopping opportunities. If you want to buy yourself a Moroccan style dress, there are plenty of options in the markets and you’ll be spoiled for choice. Just be sure to shop around to get a good gauge on what a reasonable price is. Never buy from the first guy you see! There will 100% be more stalls just around the corner selling the exact same thing. Should I wear Moroccan traditional dress when I visit? Moroccan fashion is really cool! I couldn’t help but buy myself a blue tunic type dress and I love it, but to be honest with you, not a lot of women were wearing these styles on the street so it’s not like the dress helped me blend in in any way. If your goal is to “look more local” by dressing in traditional Moroccan clothes, that might not work too well, but if you’re looking for a unique outfit to remember your trip by, then by all means, browse away! Some of the designs really are gorgeous. How is Morocco weather in December? Will I need to pack lots of warm clothes? Morocco temperatures in December vary quite a bit around the country. As I listed in my ‘Important Considerations Before Deciding What to Wear in Morocco’ section, how cold it gets depends entirely on where you are in the country. If you are trying to decide what to wear in Morocco in December, I have a sample winter packing list above, alongside different temperature estimations for the wintertime. What about visiting Morocco in January? Will I be cold? Just like in December, Morocco in January can be a little chilly, but you won’t be freezing cold so long as you’re prepared. If you’re wondering what to pack for Morocco in January, I would refer to the sample winter packing list I have above. Any more questions about what to pack for Morocco and what clothes to wear in Morocco? I hope you enjoyed this post crammed with detailed Morocco clothing advice! If you still have any questions on how to dress in Morocco or perhaps your own experiences and suggestions to share, feel free to comment below! Have a great trip! Previous Article14 Crucial Morocco Safety Tips + Common Scams: Is Morocco Safe For Tourists To Visit?